Even when the little ones think they are too old to take a nap, a rest time is an essential... and many days that rest may turn into a nap. Having a nap kit, that holds their blanket, and pillow securely in their own bag, is a great way to make sure their belongings stay together and stay clean. These free patterns will guide you through basic items needed for nap time. If you have an embroidery sewing machine, now is an excellent time to use it.... to embroider the child's name on everything! If you're ready to start, You'll need approximately one yard each of fleece and one are of a coordinating cotton fabric, a travel pillow and about a yard and a half of cord... and thread to match your fabric. Find some matching cotton fabric with a coordinating fleece fabric to create a total kit with these instructions. Everything you need for a complete nap kit is part of this kit with free instructions for every aspect of what you need for a complete nap kit. A travel pillow is a small pillow that measures approximately 10" by 14" or 12" by 16 or 18". They can be found anywhere pillow forms are sold and even in many drugstores. The design of this pillowcase, keeps the pillow in the pillow cover so the pillow stays clean. You may want to make one (or two) to match the blanket and bag. Sew a Simple Pillow Case for a Travel Pillow - This simple pillowcase is a perfect nap pillow. It's also a great "cough" pillow for anyone you know who is having surgery. Make a pile to have spare nap time pillow cases and get-well gift ready for when they are needed. 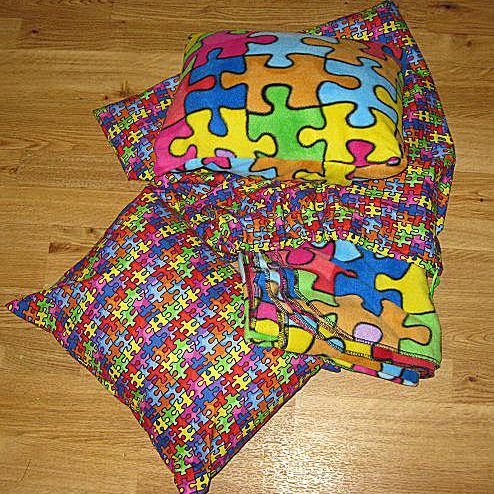 Throw Pillow Patterns - A novelty pillow can be special because of the fabric or the shape... the sky's the limit! Choose from ruffle edges, corded edges, appliques and many more for a truly personalized pillow. By the time kids hit kindergarten, it would be embarrassing to be seen that that favorite bedtime teddy bear. You can help make the transition a bit easier by providing a blanket out of one of the many adorable, character prints on fleece fabric. Remember a fleece blanket is easy to to sew! How To Make A Fleece Blanket - These simple to follow instructions will have you at the next sale on fleece fabric looking to score sale prices and make wonderful gifts for everyone on your gift list. How to Hand Sew a Blanket Stitch or Buttonhole Stitch - Use this simple to sew stitch to finish the edge of any size piece of fleece to create a warm cozy blanket with an edge that is not only eye catching, it keeps the edges in tact. Free Directions to Sew a Fleece Blanket with Cotton Quilt Charm - This blanket is a true novelty. It allows for the warmth and comfort of fleece but also brings in any cotton print for a truly personalized blanket. Make the couch size blanket for a wonderful and cozy blanket any child will love. Make the doll size to match so a little girl will have a matching blanket for her favorite doll. A quillow may seem like a good idea for nap time, but what are the odds of it actually getting folded to put it away? Odds are, you're lucky if it gets stuffed in a bag. A tote bag can provide the container that is needed to keep the pillow and blanket together and off the floor so it stays clean.